Preserving the fuel diversity and affordability of our power supply while also reducing emissions is not only smart energy policy, it’s a tall order. It’s a challenge not unlike walking a tight rope, and current trends suggest we are losing our balance. The loss of fuel-secure baseload sources of power and our growing overreliance on natural gas portend trouble. Keeping our footing is going to require an all-of-the-above energy strategy, not the lip service paid towards one we’ve grown too accustomed to. As a new report for NMA from Wood Mackenzie highlights, encouraging the deployment of advanced coal technologies can be the lynchpin to helping us maintain our balance. The report’s story is an important one and it turns some assumptions about U.S. technological leadership on their head. 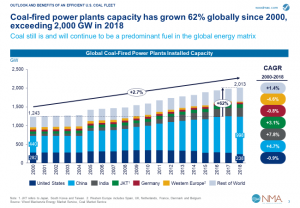 Since 2000, global coal-fired capacity has grown 62 percent to exceed 2,000 GW. As the global coal fleet has grown, the share of high efficiency, low emissions (HELE) plants has jumped as well, from 30 percent in 2010 to 40 percent today. But while penetration of HELE technology has jumped globally, the U.S. hasn’t kept up. Just 28 percent of the U.S. fleet uses HELE technology. Comparatively, HELE penetration is far higher in Western Europe (71%), Japan (74%) and even China (66%). While deployment of HELE technology has been slow here (more on the reasons why a little later), these advanced coal technologies are being cost-effectively deployed around the world. HELE adoption in Europe, Japan and China is proof of that. Advanced coal is providing the foundation for affordable, reliable and secure power; it’s also playing a key role in reducing emissions. A one percentage point improvement in in the efficiency of a standard coal plant results in a 2-3 percent reduction in CO2 emissions. Improving the efficiency of the U.S. coal fleet from 33 to 40 percent with HELE technology could cut U.S. coal plant CO2 emissions by up to 21 percent. That’s a significant reduction within reach with existing technology that won’t require rebuilding the grid or sacrificing reliability and resiliency – pitfalls of too many alternatives. And, as the World Coal Association has highlighted, HELE deployment is also the first step towards eventual deployment of carbon capture, utilization and storage technologies essential to long-term emissions reduction from all fossil fuels. Slow progress on deploying HELE technology in the U.S. can be chalked up to a variety of factors, including regulatory barriers, higher capital costs for new plants, incentives for alternative technologies and, notably, a glut of cheap natural gas. But the shale revolution is now a decade old and the market for U.S. natural gas is catching up with the glut. Natural gas demand is rapidly growing, driven by expanded use for electricity generation, our burgeoning petrochemical industry, home and industrial heating, as well as exports. Exports of U.S. natural gas via pipeline and from liquified natural gas (LNG) terminals are soaring. LNG export capacity is set to double by the close of this year. Upward pressure on natural gas prices is building. To ensure we maintain an affordable, reliable and balanced mix of dispatchable fuel sources, it’s critical we both preserve our current coal fleet and look to deploy advanced coal technologies. A diverse electricity mix protects our economy and consumers from price increases or supply disruptions from any one fuel. With more coal reserves than any other country, the U.S. is uniquely positioned to meet its energy needs with a secure, affordable source of energy. Whether it’s soaring electricity demand from deep electrification and the rapid adoption of electric vehicles, the return of volatile natural gas prices, or the challenges that come from integrating renewables, we can’t overlook the need to be nimble. Preparing for the energy uncertainty ahead can be achieved through balance. A balanced grid that utilizes the potential of advanced coal technologies can help us reduce emissions without sacrificing the affordability and reliability Americans demand.